Mimsy and I are pretty boring. There is not a lot of variety to our walks. 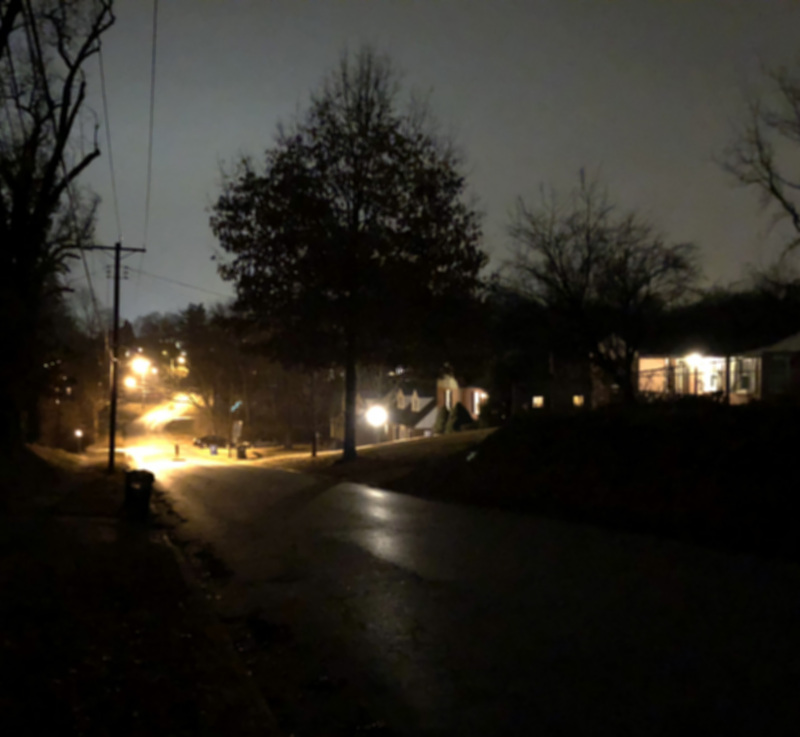 We reach the end of our driveway and go left or right, maybe throw in the occasional side-street, but we stick to the familiar routes … and that’s okay. 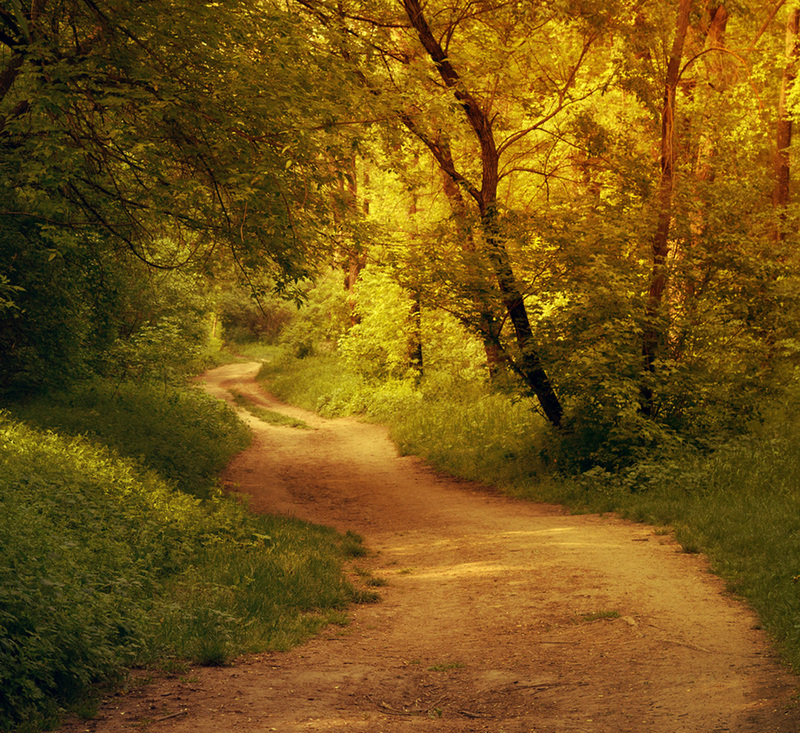 There is a comfort in traveling known paths. Mimsy knows the telephone poles and tree trunks that yield the best scents, which dogs have come and gone along this way. I think about my neighbors as we pass their houses. I know where to watch for uneven slabs of sidewalk and fallen sweet-gum balls. Everything does not have to be an adventure. For that we have life. You don’t have to walk this planet very long before you understand that (in spite of our best intentions and plans) life just rolls our in front of you. It’s as if you have stepped on a moving sidewalk that has lost all its safety mechanisms. We wonder whose hand is on the control as the path speeds past vacations and slows to a crawl during difficult times. We don’t move down the path as ballet dancers or figure skaters. We bumble. We stumble. We fall on our asses … a lot. But we pick ourselves up and keep going. We rinse and repeat and if we are paying attention, we learn something along the way. We learn that we have no control over the events that sweep by us, we only have control on how we respond to those events. We learn that we fail in that regard too. We learn that we are not saints, asking for forgiveness and resolving to do better the next time. Life rolls out in front of us. It is a very messy pilgrimage. We look at other travelers and try to gauge their journey … is it smoother than ours, is it rougher? We see people win the lottery, and others get cancer. We see bad things happen to good people, good things happen to bad people and vice-versa. Life is not fair. If you are a parent, chances are you have used that phrase with your children. Chances are, they looked at you having no perspective of what you were taking about. Give them a few years. Life is not fair, and that’s okay. Fairness implies justice. Justice is harsh, absolute and unforgiving. I know myself too well, I don’t want justice. I much prefer grace and mercy. Mimsy is not concerned with “atmosphere” or Christmas tradition, all she knows is that she has to go out and wade through the cold stuff to do her business. I guess I understand her viewpoint, 3 inches of snow is 1/4th her height, that would be like me going out barefoot in snow up to my knees. And as she reminds me, I get to stay inside where it’s warm to do my business. Fair enough. Mimsy and I did share one common Christmas wish though, and it had nothing to do with snow. Mrs. Poppy and myself host Christmas dinner. We have the room, Mrs. Poppy can do Christmas decorations suitable for a Norman Rockwell painting, and I love to cook. It’s an arrangement that no one has complained about. This year our entire family (plus) was in attendance, two daughters, two grand-kids, one son-in-law, one boyfriend and two parents belonging to the boyfriend. We tried to institute a new rule about gift-giving this year. The terms were simple and easy to understand, or at least I thought so; No presents were to be exchanged between adults, only the grand-kids would receive presents. I thought this was a swell idea. It would save everyone money and shopping hassles. I certainly didn’t need anything and I’m pretty sure neither did any of the other adults. My plan did have a massive loop-hole that I didn’t foresee. Playing by the rules, my daughters should not have been able to get me or Mrs. Poppy any gifts, but that did not stop them from having the grand-kids from buying presents for us. No grandchildren have ever given so many gifts that they were so blissfully unaware of. In spite of the loop-hole (I will tighten that up next year), it was a wonderful Christmas. Banished to Mrs. Poppy’s studio during dinner, Mimsy did not think it so wonderful, and she let her displeasure be known. Weighing all of twelve pounds, she does not have the lung capacity of a German Shepherd, something we and our guests were thankful for. Still she managed to be heard. Mimsy is the lowest maintenance dog we have ever owned, but the breed is known for having separation anxiety, and she has that in spades. We received Mimsy as a rescue, she was only two when we adopted her, but she had already had two families, plus the foster parents. Perhaps that plays a part in her anxiety, I need to talk to her about that. Half-way through dinner we decided to liberate her. 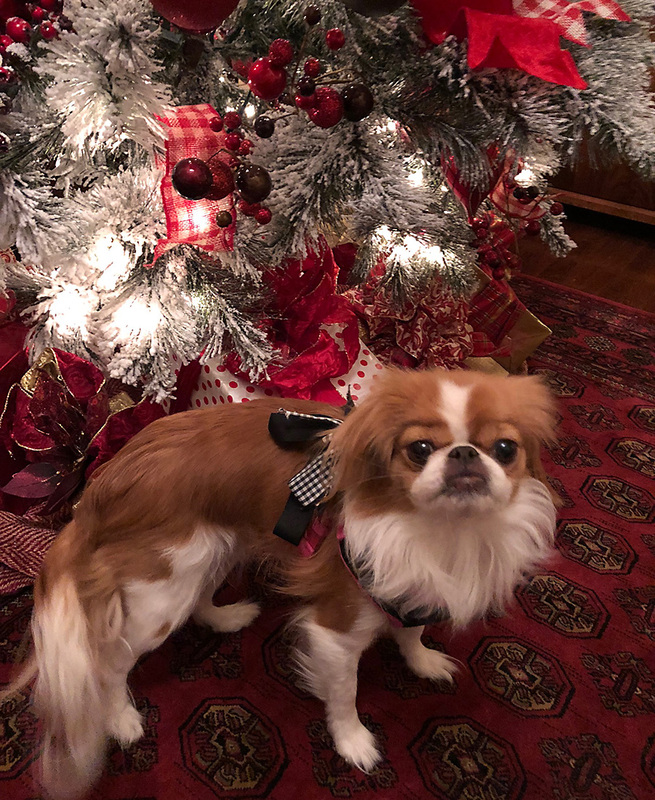 She flew down the stairs, made a few laps around the dining room table, did a little sniffing and snuffling, bounced around like a wind-up toy for a few moments, then settled down. She was content. Loop-holes or temporary banishment to an upstairs room, Mimsy and I received our one Christmas wish. It’s simple and it’s perfect … just being with family. Mimsy and I stepped out for our evening walk. For the first time this season, I noticed my breath coming out in whispy, white vapors. I had already grabbed a coat, one that hadn’t been worn for eight months. At least for now Mimsy was going to have to do with her natural fur coat. She didn’t mind. The crisp air seemed to invigorate her, she sniffed deeply before jumping and prancing around, crashing noisily through the fallen leaves. A month earlier, the dominant sounds would have been of crickets, katydids, cicadas and tree frogs. They are dormant, silent now, waiting patiently as our planet makes its yearly circuit around the sun. It’s a transitional season. The trees around us are in the process of a wardrobe change. 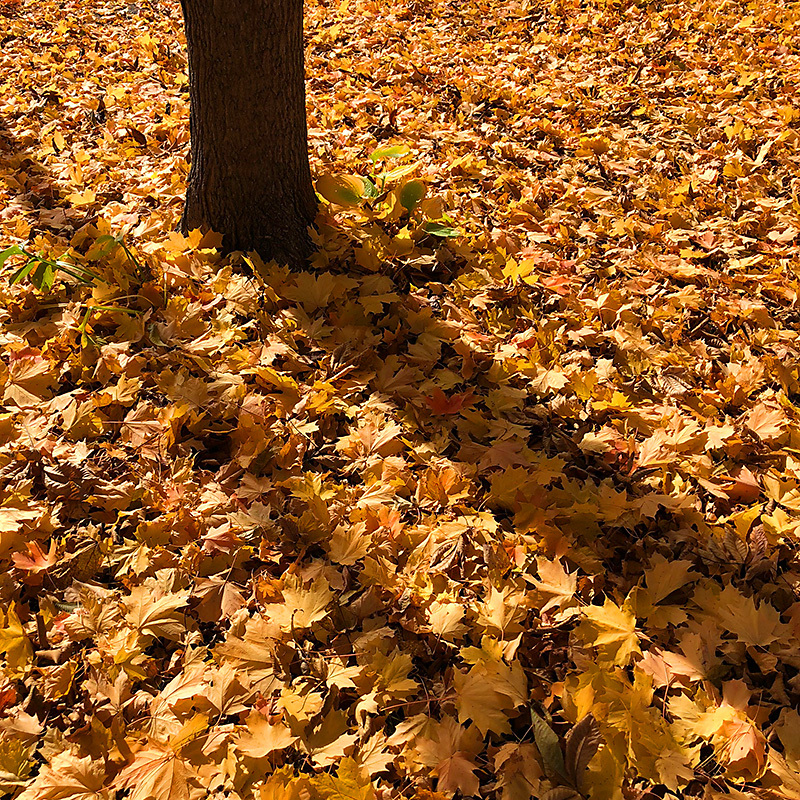 The lawn is still green and what little can be seen of it contrasts sharply against the fallen leaves. Most of the leaves are of brilliant hues. Even on this cloudy day at dusk they seem to glow as if powered by leftover energy from the sun, gathered throughout the summer and saved for this moment. Our house is 127 years old, ancient by some standards, young by other standards. Much like myself. My grandchildren consider me old, while my mother considers me young. My aging is different from the trees, we both add a little girth each year, but my body doesn’t change with the seasons. Regardless of their age, and many are older than our house, the trees follow an ordained sequence as our planet circles and tilts closer and further from the sun. In a few weeks most of the leaves will have fallen, leaving the tree limbs bare against the ultramarine winter skies. But they are not dead, they are resting, waiting until our globe circles a little further around the sun. The next season will bring new life, the trees will be maids again, donning brilliant, fresh spring greens. They will call to the birds, “Come build your nests in my branches, as your parents and the parents before them have done.” The tree frogs will find crevices and nooks, safe places, shaded from the sun in the same trees. New generations of cicadas and katydids will join them and again fill the neighborhood with joyful choruses. A few months later, the maids will become dowagers. They will wear clothes of dark green, sliding toward browns before autumn calls once again and they shed their garments in luminous shades of yellow and gold. Mimsy and I walk down the sidewalk. I think of seasons, of cycles, of rhythms. Mimsy thinks mostly of squirrels and of scents hidden under the fallen leaves, the origins of which I prefer to be left undiscovered. I think again of turnings and rotations. In just a few weeks we will celebrate another cycle around the sun. We will throw parties. We will look backward and recall the events of the past year. We will raise a glass in memory of those we have lost. For some we will say, “Good riddance,” and to others we will say, “How will we go on without them,” and we resolve to one day be in the latter group. We will attempt to look forward, wondering what the new year will bring. And we will make grand resolutions. These turnings are a part of our existence. They bring new life and death. The cycles will continue, I have no say in the matter. I am just along for the ride, an observer. We have the big ones, the yearly circle around the sun, but we also have ones that occur every day. For some reason we save our resolutions for the big, once-a-year rotation. We make New Year’s resolutions based on grand, ambitious, but often un-achievable goals. What if instead, we made 365 micro-resolutions. A daily declaration to do something small but attainable. Learning a new word, walking past the food-table at the office without picking up a cookie, making the effort to show an unexpected kindness. Mimsy and I head home. I’m pretty sure she is focused on the treat that awaits her upon our return. I’m focused on my micro-resolution. Let’s see if I can get through my commute tomorrow without hitting the horn … not even once. That seems doable. Check back later. Well, I’ll jump off and smile back at you. But I’m dizzy so it may be so. Yeah, when I do fall I’ll be glad to go. I read the entire article by Ms. Pollitt. By the time I finished, and it wasn’t that long, I was emotionally drained. We have never met, but she obviously hates me on any number of levels. I wondered if I should find a way to hate her back, that seemed like the appropriate respond, but the only emotion I could muster was pity. If she knew I pitied her, I’m pretty sure she would become even more enraged. In some perverse way, hate has become a virtue (if you hate the “right” people). If you hate that much, then what brings you joy? I’m not sure I want to know. Is happiness considered a weakness? Of course, Ms. Pollitt hardly has the monopoly on hate. If you read the comments thread of any, even slightly controversial news article you will understand that. The main purpose of social media in general is to provide the opportunity to post cute cat videos and engage each other in heated and often hateful debates over extremely trivial subjects. I’m no saint, ask my family. I get mad. I’ve been known to lose my temper and slam inanimate objects around. I’m not proud of that and I always feel very silly and juvenile when I cool off. But that’s not hate, that’s just me channeling my inner two-year-old. After reading her article I tried to find someone to hate. In my mind I ran through the entire catalog of everyone I know or have ever known, but couldn’t come up with anyone truly hate-worthy. Maybe I don’t know enough people. Maybe I’m emotionally deficient, somehow lacking in the full range of feelings I should possess. I’m pretty sure if someone deliberately harmed a member of my family I could hate them, but I don’t want to test that theory for obvious reasons. Maybe I’m starting too big, perhaps I should bring it down a notch. Mosquitos … poison ivy … people who throw trash out of their car? I’m getting closer but still haven’t achieved the right level of vitriol. Wait a minute … I think I’ve got it. It’s that stuff in the aerosol can that is passed off as cheese. Yes! I’m calling you out, Cheese Whiz! Even the name is an abomination. It contains no real cheese, manufactured of various chemicals, has no redeeming value. Did I mention it’s squirted out of an aerosol can? I hate you Cheese Whiz! I’m not sure I feel any better, but at least it’s a start down the path of hate. Tonight, I sliced a tomato. It may have been the most important thing I’ve done all day. You see, it didn’t involve Harvey Weinstein, Donald Trump, Kevin Spacey or Hillary Clinton. Tomatoes, like people, are ubiquitous, easily found but for the most part bland and sometimes rotten. My go-to source for good tomatoes, the Ferguson Farmer’s Market has closed for the year. I was left with only grocery store options. If you are thinking, what’s the big deal, then you don’t understand tomatoes. Like you, I am bombarded with news and information to the point I don’t know what to believe. This is when I narrow the focus of my thoughts. There are few things that I know for sure, but one of them is the love of my family, and darn it, they are going to get the best tomato I can find! I seriously debated just skipping the tomato, a tasteless tomato is worse than no tomato at all. But I was on a mission, and I was in a mood … this was for family and I was going to give it my best. I paced in front of the produce section. The options were limited, hot-house beefsteak tomatoes, Roma tomatoes, and tomatoes pitched as still being attached to the vine. Looking them over, if I were a tomato, I would not have dated any of them. Thankfully, I am not a tomato. I was preparing dinner for 3 members of my family. It was a simple menu of roasted potatoes and onions and a sandwich constructed of good deli turkey, mayo mixed with a few shakes of Frank’s Hot Sauce to spread over the brioche bun, a slice of provolone cheese melted on top with a garnish of avocado and tomato slices. Can’t miss! I made the mistake of turning on my iPhone right after sliding the potatoes into the oven to roast. I had a few moments to kill, so I thought I would catch up on the news … big mistake. There was nothing that I needed (or wanted) to know, there were descriptions of things I really didn’t want bouncing around in my head, so I turned it off. I grabbed the tomato I selected, peeled off the little sticker with the price code, ran my thumb across it’s surface, laid it on my cutting board and raised my chef’s knife. The slices needed to be thick enough to taste but nor so thick as to make eating difficult. A gentle sprinkle of sea salt compensated for any lack of flavor. There are moments when things come into focus, when it’s easy to separate the wheat from the chaff. It’s rarely big events … most of the time it’s the ordinary, the common. The trick is learning how to spot them. 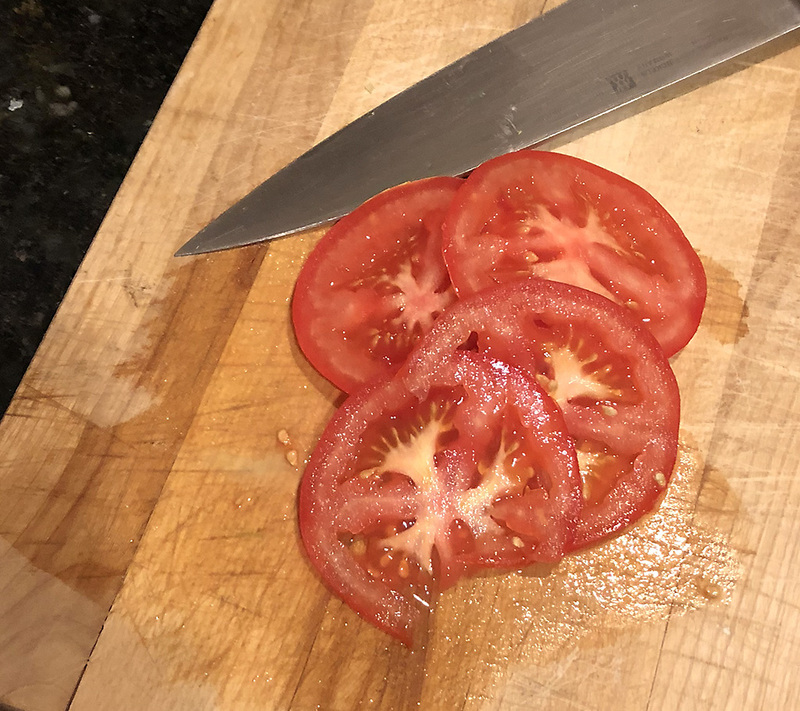 Screw you Harvey, Donald, Kevin and Hillary, tonight I’m slicing a tomato for my family!